Bible Lessons From The Outdoors: Activities: Ideas To Get Your Kids Outside! Activities: Ideas To Get Your Kids Outside! Lack of outdoor time has become such an issue that governments and schools are acting to help get kids back outside. The 2015 Every Student Succeeds Act included for the first-time Federal funding available for school programs that incorporate outdoor learning through environmental education. Many states have No Child Left Inside programs. Forrest Kindergarten programs are becoming more popular. Nearly every State and Federal Park and many local parks offer programs designed specifically for kids. Our kids seem to be going outside on their own less and less, so programs help to reverse that trend. Parents, teachers, and youth leaders can help to get kids outside. Here are a couple of ideas to get you started. 1. Create a Green Hour each day that your child spends outside, weather permitting. 2. Try different activities until your child finds something they really enjoy. Keep doing new activities from time to time. Take children to the park and go on a scavenger hunt. This is a great introduction for children who don't spend much time outside to show them it can be fun. Get guidebooks that can be used to identify trees, birds, rocks, or other items in the yard. There are also apps that can help in identifying. Start a photo album or PowerPoint of pictures taken outdoors of birds, flowers or the weather. Identify and label each one. Build a fort in the yard. Learn about wilderness survival skills and practice them outdoors. Spend the night in the fort or emergency shelter. Make a map of your yard or community. They can make it as detailed as they like in the sand or on paper. Help them use a compass to make it more accurate. Put up a feeder, house, or bath for birds or squirrels or insects. Bat houses are also common. Research what type of feed or houses are best for different species in your area. Learn how to make your own feeders or houses. Collect samples of natural objects. Make a poster identifying what was collected. Learn to identify cloud types and predict the weather. Gather some weather tools such as a thermometer to track the weather and learn to predict it. Star gaze at night. Learn to identify the them and their movements. Consider getting a telescope or joining an astronomy club and using theirs. Plan a camping trip in your own yard or a local campground. Learn what all you need to go camping and pack everything. If camping in your yard, consider staying out of the house until the next morning. This will make it more realistic. Get some typical outdoor toys like a bicycle, scooter, jump rope, frisbee, basketball hoop, or trampoline for your child. Ask them which they like. These items don't have to be new. Go for an evening or morning walk for 20-30 minutes. This is another great family activity. Play I-spy along the way. Let your child play in puddles or in the mud. Most kids love to do this especially after it rains. Be sure use old clothes. Plant a garden of food or flowers in your yard or in pots. Consider getting your child involved in a local community garden. Pick your own food. At certain times of the year many farms allow the public to come and pick their own produce such as berries. Afterword make a delicious recipe. Create nature art. Let your child collect several natural items like leaves, rocks, shells. Then do an art project such as decorating a flower pot, making a collage, or preserving them. Similarly, create art outside with sidewalk chalk or painting. Create a sensory journal. 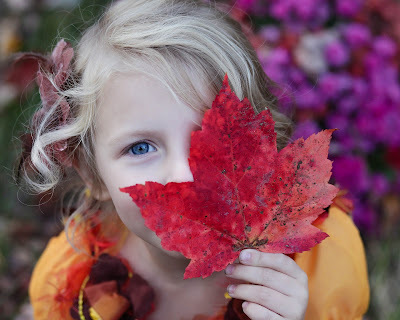 Try to see how many different colors, smells, sounds, or textures your child can find. Have them record and describe each one and identify what made it. Don't include taste, you don't want a child to lick something poisonous. Learn some outdoor games like hide and seek or lawn games like corn hole. Play these once or twice a week with your child or teach them to play with others. There are hundreds of games that can be played outside. Look for new ideas online or in a book. Consider enrolling your child in an organized sport like soccer. Get your child a magnifying glass kit. Have them log or journal their discoveries. They can also draw what they see. Alternatively try a microscope kit. Give your child some outside chores like tending the lawn, weeding, picking up trash, washing the car, or raking leaves. 1 Amy Novotney. “Getting back to the great outdoors” (March 2008). Monitor. 2008;39(3):52. http://www.apa.org/monitor/2008/03/outdoors.aspx. 2 Susan Strife and Liam Downey. “Childhood Development and Access to Nature: A New Direction for Environmental Inequality Research.” Organization & Environment. 2009;22(1):99-122. doi:10.1177/1086026609333340. https://www.ncbi.nlm.nih.gov/pmc/articles/PMC3162362/. 3 Shannon Brescher Shea. “How gardening can help build healthier, happier kids.” The Washington Post. 28 July, 2017. https://www.washingtonpost.com/lifestyle/on-parenting/how-gardening-can-help-build-healthier-happier-kids/2017/07/17/d9047164-6599-11e7-8eb5-cbccc2e7bfbf_story.html.